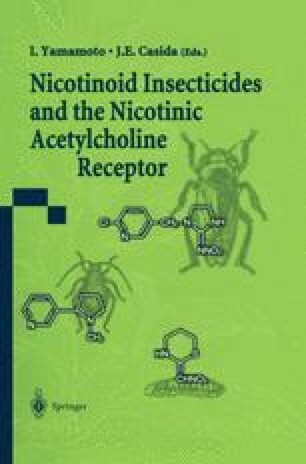 The insect nicotinic acetylcholine (ACh) receptor (nAChR) is the target not only for the botanical insecticide nicotine but also for the synthetic nicotinoid insecticides such as imidacloprid (IMI) (Bai et al. 1991; Tomizawa and Yamamoto 1992, 1993; Liu and Casida 1993; Liu et al. 1993, 1995; Tomizawa et al. 1995a; Matsuo et al. 1998). Knowledge of the structure-activity relationship (SAR) of nicotinoids contributes to an understanding of the functional architecture of the nicotinic acetylcholine receptor (nAChR), a generic interrelationship of SAR and target site research applicable to any agrochemical or pharmaceutical. This approach has helped us to understand the action and selectivity of the new and increasingly important synthetic nicotinoid insecticides useful in controlling important pests and in resistance management programs (Casida and Quistad 1998).